It is notable how Donald Trump and Nicolás Maduro have very similar approaches to the media. All politicians get annoyed by free press--it's the nature of the game. Presidents who accept democratic rule complain and mostly have to endure it. Presidents who do not accept democracy find ways to hurt the offending outlets and go after individual reporters. It's the way these two presidents (and their allies) do so that seems so similar. Take this Reuters story on El Nacional, which it labels the last independent paper standing (what about the Latin American Herald Tribune, though?). It sounds like Trump taken to the logical next level. Both governments simply label facts as fake. Sound familiar? It is exactly what Donald Trump says on a regular basis. His supporters also routinely use the word "coup" to justify attacking the media. The Venezuelan government is nailing the paper with fines to drive it into bankruptcy and/or justify raiding it. Trump hasn't done that, but it's not a stretch to imagine it. Indeed, at this point Trump has a majority of Republicans convinced that he is a more reliable source than the media, given his unrelenting attacks. The question is when insults and slights (e.g. refusing to answer questions) cross the line into trying to destroy the outlets themselves, not by sledgehammer but by a death from a thousand cuts. I grew up in San Diego, and am now visiting. Today I heard an ad on the radio from MORENA. We know how much Mexican and Central American candidates in particular campaign in the United States, mostly California, because their citizens--often dual citizens--can vote from abroad. This was the first election where they could vote not just for president but for down ballot candidates as well. The ad was in English and thanked supporters, saying that MORENA would be working to improve things in Mexico--I don't remember the exact wording, but it struck me how it was in English. I wonder what the average non-Mexican listener thinks of it. Periodically I'll write that a particular novel is perfect for a plane, which means good plot development and entertaining. That is certainly the case with Andrew Shaffer's Hope Never Dies. It has an exceedingly creative premise. Joe Biden is a bit down in the dumps, wondering why his buddy Barack is globetrotting with famous friends and never seems to have time for Uncle Joe. Then the former president shows up and the two start haphazardly investigating the death of an Amtrak employee Biden knew on his many famous trip from Delaware to DC. Sound crazy? It is, and really funny. Drop all disbelief and just go with the flow. Of course more people would recognize them, of course it's hard to imagine Obama busting into a biker bar with a sawed off shotgun. Just let it go. It's a fun mystery and the narration in Joe Biden's voice is highly entertaining, just exactly how you would expect it. Honest, outgoing, colorfully colloquial, always pining a bit for Obama. Obama is super smart, cool, and loves Biden like a brother even though he comes off as distant. Why Is Immigration So Important to People? I've spent years saying (accurately) that immigration is just not a major issue for people, especially when they're voting. As I had a student point out not long ago, that is a point made in my book that is no longer true. A record 22 percent of Americans said this month that they believe “immigration/illegal aliens” is the most important problem facing the United States, according to Gallup polling numbers released on Wednesday. This is deeply frustrating because we know that demography and other factors have led to a situation commonly referred to as "net zero" immigration. This won't last forever because demography is ever changing. But whatever crisis people feel is way behind us. Further, migrants aren't stealing jobs. People are not making the connection that President Trump is complaining about migrants while also acknowledging that there are thousands of skilled jobs that Americans aren't taking. There is a worker shortage in this country and we are just about at full employment. Further further, people are afraid of MS-13 but this is not an immigration problem. This is a homegrown gang with transnational ties. Messing with immigration won't affect it. Better drug policies and attention to local community needs would. Now, after that ranting, let me offer a ray of hope. It may well be that the relevance of immigration has soared in large part to a common sense response to the anti-empirical arguments being repeated all the time. In other words, many people appreciate and value immigration and now believe it's important to stop separating families, to support family unification, and more generally promote human rights. Maybe people think the "problem" is policy, not the migrants themselves. So what percent of the 22 percent see immigration as a problem versus a good thing? We can find hope in the fact that more Americans than ever would like to see immigration increased and more than ever (75%) believe it is a good thing. Or maybe more people than ever are showing their racism and xenophobia. I will leave it to you to decide. How Will AMLO Deal With NAFTA? Brian Palmer-Rubin has a post at The Monkey Cage blog about clues to AMLO's response to NAFTA. He argues that Mexico's long-standing clientelist structures meant that labor and peasant unions never really pursued substantive change. That's what AMLO might change. If López Obrador plans to follow through on this promise, we should see representatives of organized labor, small business and peasant associations at the NAFTA bargaining table. Provisions for foreign investment would be geared to not only factories that employ low-paying manual labor — jobs that are increasingly under threat by automation — but also technology and service-sector firms that promise to train and employ high-skilled workers. And negotiators would pursue agricultural terms that favor Mexican exports of high-value crops such as avocados, coffee and tomatoes. These trade provisions would be accompanied by domestic policies that enable small businesses and small-scale farmers to obtain the financing they need to reach more lucrative markets. That's a tall order, but would be fascinating to watch if it happened. It would drastically shift the tenor of the discussions. Most accounts offer a more standard outlook, i.e. AMLO has consciously tried to calm down business and there will be a lot of continuity. That is rather different than having peasant associations at the bargaining table. There is a new senate bill that would impose sanctions on Nicaraguan officials responsible for human right abuses (see the text here). It also calls for credible negotiations and early elections. Pretty standard stuff, and a continuation of the sanctions already in place. However, Ted Cruz takes it one step further by adding something not mentioned in the bill. This strains credulity more. Russia is certainly involved in both Nicaragua and Venezuela, but how much illicit activity is occurring that would rise to the level of a national security threat? These are most often overblown. He has made the pitch before. Fine, go ahead and target the assets and see what they show you. My guess is that it will be minimal. I've mentioned this exaggerated Nicaragua-Russia "nexus" back in 2016 as well. Latin American diplomats say that given its immigration policy, the U.S. has no moral authority to call for Latin America to do more with regard to Venezuelan migrants. Fair enough. But they take it one troubling step further. Mimicking the Trump administration, some countries have already taken steps to tighten their border controls as the public has begun complaining to elected officials about extra competition for jobs. Fernando Carrera, the foreign minister of Guatemala in 2013 and 2014, understands the diplomatic complaints, but said it will not change the reality that governments must deal with incoming Venezuelan migrants. In other words, if you don't do anything, we won't either. That's simply awful. Further, Latin America wants the U.S. to coordinate a response. This reflects a persistent theme that tends not to get sufficient attention, which is that in times of crisis Latin America looks to the U.S. 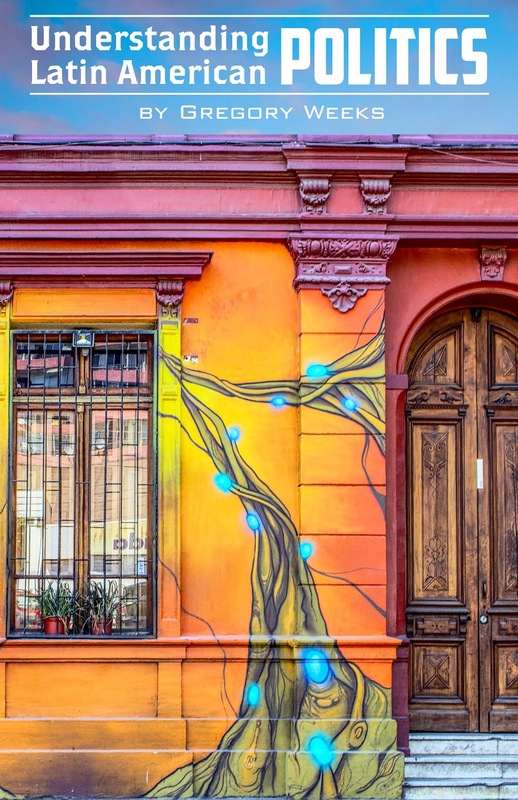 Despite all the rhetoric about unity (of which there is little) and autonomy, or even freedom from the empire, Latin America does not come together effectively in times of crisis. This was painfully obvious during the Honduran coup crisis in 2009, when even Hugo Chávez was publicly asking Barack Obama to do something. And in all things, mimicking the Trump administration is a bad idea. Don't do it. This article is an effort to better understand the discrimination mechanisms that ex-gang members perceive upon leaving the gang and seeking to reinsert themselves into a society marked by high levels of violence and inequality, as in Central America. Based on 24 in-depth interviews with former members of MS-13, the 18th Street gang, and other street gangs in El Salvador, this article analyzes the different mechanisms of discrimination perceived by respondents as a result of the stigma of past gang membership. This article also documents how these perceptions of discrimination can affect individuals who are searching for employment opportunities and seeking to reinsert themselves into society. Governments try to get people to leave gangs but do much less to help them reintegrate. They often turn to the church, but churches don't have the necessary resources. If you can't find a job, then you can guess what will happen. Go read this report on the Trump administration's zero tolerance immigration policy co-authored by Adam Isacson, Maureen Meyer, and Adeline Hite at the Washington Office on Latin America. It details the disasters the policy has created. Beyond the humanitarian problems, there is no infrastructure for doing what the administration wants. Plus, they explain how the deterrence claimed by the administration is based on poor logic that empirical evidence shows is wrong. The report also gets into the country of origin of migrants in different parts of the U.S.-Mexico border, and the conditions they are fleeing (not surprisingly, MS-13 is not a big factor). This is all complicated by the fact that organized crime has consolidated control over smuggler routes, thus dictating what part of the border people cross. The report ends with recommendations, which are mostly just common sense. That means they are unlikely to be implemented. This report is the first installment of several. I listened to Padres owner Ron Fowler's interview with Jesse Agler on his Beyond the Booth podcast. Toward the end, Jesse asked him about uniforms. If you are not a Padres fan or at least a baseball fan, you may not know that the Padres had brown in their uniforms through 1990, and diehard fans have been calling for their return ever since. The current uniforms are blue and so the Padres are just some bland copy of the Brewers. Fowler said they did focus group research. To get a sense of how this worked, see Kevin Acee's article. There were four uniforms: current, 1998 version, and two different brown uniforms. * OK, so we have four options going head to head. He continues to say that the "largest minority" likes brown. I assume he means one or the other brown option. We have to pause here to point out that the more accurate way to say "largest minority" is "plurality." In other words, the most but not a majority. In many elections, including most in the United States, plurality wins. Referring to plurality as minority is essentially pejorative. He says that the "second largest minority" is the current uniform. In plurality voting, another way to say "second largest minority" is "loser." But we're not done yet. Many countries--and most Latin American presidential elections--use runoff elections to determine the winner when no one receives a majority. Runoffs are only between the two candidates who received the most votes. In our case, the top two are "some kind of brown" and "current uniforms." The 1998 version is clearly eliminated. Fowler confirms that he believes brown would win in "side by side" (meaning head to head) as opposed to four options and that they might actually be used starting in 2020. (According to Acee, you need to finalize uniforms with MLB in the spring for the following year.) Jesse interjects accurately that this sounds like a presidential campaign poll. In short, brown won. But we're still not done. Fowler concludes by saying that "as the evening progressed" (was there beer involved here? That was my immediate thought) blue became more preferred than brown. It's hard to comment much on this without knowing their polling techniques, but I couldn't help wonder if they kept changing the questions, hoping for more blue support. Fowler started by saying that brown was the plurality, then ended by saying it wasn't. FWIW, people in the focus groups signed NDAs but talked privately and according to the Gwynntelligence podcast the sentiment was overwhelmingly pro-brown. In sum, in plurality systems brown would win. In systems with runoffs, brown would also win. Brown won. * He notes that these are not "baby poop" uniforms. He's used this phrase before and it refers to the 1970s look, I think meaning a lot of yellow. I remember vividly that a friend of mine who had a baby before me mentioned that infant poop is like wiping up Gray Poupon and I found that to be true. Fowler has now attributed the phrase "baby poop" to Tony Gwynn but I can't find any mention of him ever saying that (he said he loved brown and particularly the 1985 version). This is all confusing because Acee's article specifically says people did not like orange and brown and loved yellow and brown. Maybe I am missing something. How Does Trump Choose His Latin American Foes? Michael Shifter and David Toppelberg ask why Donald Trump is hard on Venezuela and Cuba whereas he likes dictatorships almost everywhere else. This is an interesting question. Their answer is "political ideology and his combative instincts." I'm not sure I agree. Trump does not fit well on the left/right spectrum (and why not North Korea?) and his combativeness is selective. I would emphasize two factors. First, domestic politics. They mention this but only in passing. Trump visited Bay of Pigs veterans during the campaign and sees this as important for his support in Florida. Venezuela is an adopted cause for hardline Cuban Americans as well. Trump won Florida in 2016 and I doubt any of this was decisive but he'll stick with it. Second, doing the opposite of Obama. The Obama administration opened up to Cuba and was less vocal about Venezuela than George W. Bush was. Trump is doing the opposite. The same is true of Iran, whereas Obama was tough with Russia and North Korea. In Latin America, this also helps explain Trump's hardline position on Colombia, which is an ally. One problem with this argument is that Obama was ramping up his rhetoric a bit, so Trump's policy is not really a full rejection. But clearly Obama was more interested in dialogue with Venezuela. 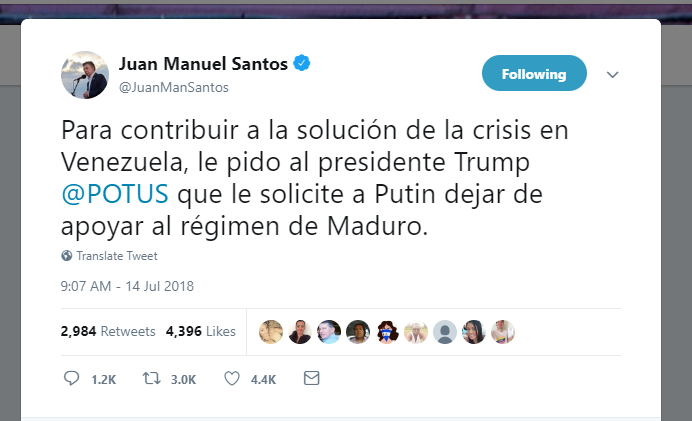 Colombian President Juan Manuel Santos tweeted to ask Donald Trump to push Vladimir Putin about his support for the Venezuelan government, though for some reason he did not actually tag Trump. This is how weird U.S.-Latin American relations currently are. The only allies Russia has in Latin America are governments the Trump administration has identified as threats, specifically Cuba and Venezuela. Trump's vocal and constant positive portrayal of Russia is a huge boost to those governments because Putin feels no pressure to reduce his support. Now we have the Colombian president pleading for Trump to do something. The funny thing here is that Santos is a rock solid U.S. ally but Trump has decided he is somewhat less than worthy. For his own reasons, Trump is desperate to remain on good terms with Putin so will likely ignore Santos entirely. That's bad news for the Venezuelan opposition, which Trump claims to support. And what it boils down to is that Trump's need for Putin's approval places everything else in the backseat. This is just not how power relations have worked in the past. Durante la reunión, el Titular del Ejecutivo Federal expresó su preocupación por la política de separación de familias migrantes instrumentada por el Gobierno estadunidense. El Presidente solicitó al Secretario de Estado la rápida reunificación de las familias separadas en la frontera y destacó la necesidad de encontrar una alternativa permanente que dé prioridad al bienestar y derechos de los menores. Here is the story of Rodolfo Rodríguez, who was viciously attacked in Los Angeles because he was Mexican. This comes further in the context of President Trump saying that immigration was destroying Europe by "changing its culture." This is a common white supremacist argument. EPN is dancing around the obvious point that the attack on the Mexican man is not really the issue, but rather Trump's constant diatribes against immigrants, which racists see as a green light to attack non-whites. So the "reset" the trip was intended to generate is already a failure. For EPN, it's too late. He caved early on Trump and hasn't really recovered. AMLO has tried to be civil but finds himself in a position where Mexico and Mexicans are demonized constantly. Homeland Security Secretary Kirstjen Nielsen met with officials from Guatemala, Honduras, El Salvador, and Mexico. There were seven main commitments made during the meeting. None of them mention figuring how to increase prosperity, which is being put off for future meetings (and perhaps forever). Mostly it is a demand that Mexico and Central America do more. --So, for example, the United States wants to accept fewer asylum cases while Latin America should take more. Obviously they have plenty of resources to deal with that. --These countries also need to do a better PR job. Tell migrants not to come, and of course they will listen. --Y'all need to give your police more weapons. Don't worry, you can trust them! Who will pay for all this? Well, you of course. That's what we call "collaborative momentum." We push and you start rolling. Christine Wade has an article in World Politics Review about corruption in El Salvador. Some question whether pursuing crimes of the past is a good use of scarce resources, given current levels of corruption and crime in El Salvador. But the legacy of impunity directly influences contemporary attitudes about crime and corruption. The failure to punish past crimes has led high-ranking public officials, like Funes, Saca and Flores, to believe they are above the law. Criminals, elected and otherwise, commit crimes knowing that they will likely never be prosecuted, much less convicted. This is all happening at the exact same time that the Trump administration is intentionally weakening CICIG in Guatemala in return for Jimmy Morales' support for the Jerusalem embassy, which for Morales was a planned quid pro quo. In other words, national institutions in Central America are horrifically weak, and Donald Trump stands ready to make sure that no international body can help out either. The bigger question she poses is about the build up of corruption. If you don't prosecute the old ones, no one will feel accountable. It is now almost a cliché: Latin American candidate campaigns on an anti-corruption platform, then later is found to be corrupt. Help from the United Nations (i.e. like CICIG) is no cure-all, but I can't think of any other way of kick starting the process. If we undermine that, then we're stuck. And, incidentally, if the U.S. undermines efforts to deal with corruption, then the U.S. is directly contributing to the continued erosion of the rule of law, which in turn is contributing to emigration. But that's a whole other story. Who's To Blame in Nicaragua? The Havana Times reprinted an interview originally published in El Faro with Jacinto Suárez, a high level Sandinista and long-time comrade of Daniel Ortega. In it he describes his view of the current crisis, with good pushback from the reporter. Buckle up. The situation is being directed by the United States, the oligarchy, and narcotraffickers. Now, you might ask, what changed this year since both the oligarchy and the United States were not particularly concerned about the status quo? The oligarchy is angry because it can no longer sell cattle to Venezuela. "That's the key to understand this." I am not making that up. The United States is angry because..."it's the empire's decision." That's it. The narcos want to disrupt the positive relationship between the police and the people. Right now the people love the police and the narcos don't like that. His answer? Dialogue. Dialogue about what is unclear when it is founded on this. Ioan Grillo wrote a much-needed op-ed for the New York Times about why AMLO's election is cause for optimism. Despite violence, Mexico had an election, the winner won (no small thing), and the losers graciously accepted the results. That's a big deal and is not definitely not the case in a number of Latin American countries, including some of our allies. One thing I would add is that you don't hear accusations that he will try to abolish term limits or otherwise push past the six years in office. That is also not the case in everywhere. At this point, the speculation about how AMLO will govern is already getting old. We know he's not Donald Trump (despite the constant punditry pushing that and even Trump himself) but we won't know how it will go until he's actually there. At least until then, it's worth looking on the bright side. The landslide victory of Andres Manuel Lopez Obrador in Mexico's presidential election is likely to provide some relief to another leftist firebrand: Venezuela's Nicolas Maduro. Lopez Obrador campaigned on a promise to return to Mexico's traditional foreign policy of nonintervention, putting him at odds with his predecessor's efforts to build a regional alliance to bring pressure against Maduro's socialist government for taking Venezuela down an increasingly authoritarian path. Since AMLO has emphasized non-intervention, and incoming Foreign Minister Marcelo Ebrard has said that Mexico would not "intervene" in Nicaragua or Venezuela, this makes some sense. But I feel like we need to be careful not to take it too far. First, I put "intervene" in quotes to point out that it is not synonymous with "doing nothing." AMLO has no interest in coercion but that doesn't mean he isn't open to prodding Maduro in his own way. I have no idea whether that will happen but I can at least easily imagine something like it. AMLO has been very careful not to embrace Maduro and indeed to keep a distance. They are not ideological soulmates. Mexico actually has a long history of trying to resolve conflicts even under the banner of non-intervention. Second, let's not overstate the progress being made in terms of regional response to Venezuela. The Mexican government joined in sponsoring the June 2018 OAS resolution on Venezuela, which among other things declared the electoral process illegitimate and called for member states and the OAS itself to start considering appropriate measures. So maybe the baby steps get a little bit babier. But Latin American governments don't want to do much and likely never will. There is just too much bad history, led by the United States. Back in 2003, the Bush administration bullied Chile and Mexico, both on the rotating seats in the UN Security Council, to vote for the use of force in Iraq. I've used that in class to spark discussion of how and when the United States tries to force Latin American governments to do something. Fast forward to today, and the Trump administration is doing the same thing for...formula companies? The administration disliked a UN resolution praising the benefits of breast feeding. So what the U.S. did was make Vladimir Putin into the hero of the developing world! This whole affair was mindbogglingly stupid. Further, in Ecuador you have made Lenín Moreno look bad, and he is a center-left president who has shown interest in working with the U.S. He will face fire at home because of you. From a normative perspective, you have staked out a position that clearly privileges profit over established science. That is not just unethical but also clear as day to a world already suspicious of your motives. I don't think there is any silver lining. 1. Same old story. It dropped because global prices for commodities dropped. And this is why Chile's decrease was so sharp ($12.3 billion to $6.4 billion). 2. European countries account for 65% of investment in renewable energy. The U.S. has no excuses for not being higher in such a key industry. 3. Data isn't even collected for Venezuela anymore. 4. Central America and the Caribbean did not drop. That highlights a problem the United States has as well. At the macro level, you can see good signs. But the investment and growth is not translating into higher wages and more secure jobs. 5. China appears here and there (especially in Ecuador) but it is not a major player in FDI at this point. The field is dominated by the U.S. and Europe. On the heels of Vice President Mike Pence's Latin America trip, the Treasury Department has sanctioned three Nicaraguan officials, including the National Police Commissioner, since the police have been deeply involved in repression. So the roving eye of the administration has finally fully reached Nicaragua. I can't think of any reason that the outcome won't be like Venezuela, where the individual sanctions have symbolic but not much practical impact. It has been over three years since President Obama first rolled them out. Venezuela is hit much harder by financial sanctions, though at this point it is impossible to know how much those sanctions have changed any calculus within the armed forces. I also can't think of any reason why the Trump administration wouldn't just treat Nicaragua in the same way. If individual sanctions do not yield the desired result, as they won't, then broaden them to more people. If that doesn't work, then go after financial transactions of whatever sort. That will certainly hurt the regime more, but we don't know whether that will yield the desired result either. That is pretty vague. There is no way to measure whether dialogue is a ploy. I mean, it almost certainly is a ploy, but at what point do you make that determination? Same with investigations--they can reasonably take a really long time, but how long is too long? The last point about the military is easier because in fact the army doesn't want to be involved. The violence has been perpetrated largely by police and armed gangs. I'm quoted in this story about Russia's interest in Cuba and how Trump's reversal of normalization plays into Moscow's hands. I made the point earlier this year that Russia was clearly a suspect in the Cuba sonic attack affair, and in April I wrote more broadly that "As Trump creates vacuums, Russia is ready to fill them." In Cuba this matters more because the Russians have enjoyed uncontested influence there for decades. Last year on my podcast I talked to Mervyn Bain, who studies Russian-Cuban relations. There is even nostalgia in Russia for Cuba and strong cultural/nationalist resistance to losing Russia's position there. In other words, the stakes are higher than we in the U.S. perhaps appreciate. And it's a zero sum game, at least in Russian eyes. If the United States and Cuba improve relations, then Russia loses. Its privileged position is based entirely on U.S. hostility. The more hostile Trump gets, the happier the Russians are. 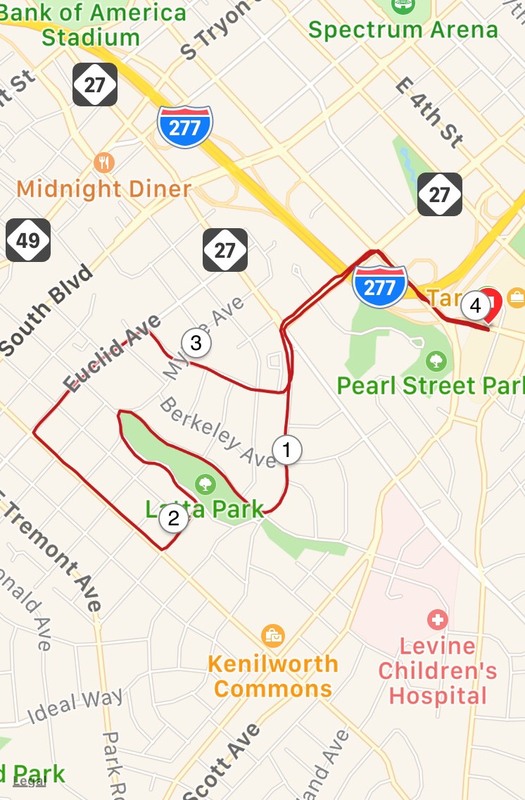 As part of my year of running (see my initial post here) I ran the American 4 Miler. It was a new course this year and was rolling hills. 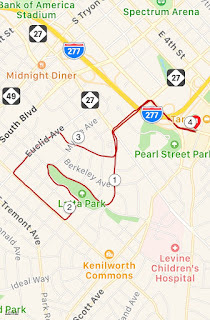 The course is all just south of downtown Charlotte. This was the second of a six race series put together by Run For Your Life, a running store that has one of their stores not far from my house. One nice feature is that they all have NoDa beer at the end. And here are the hills. 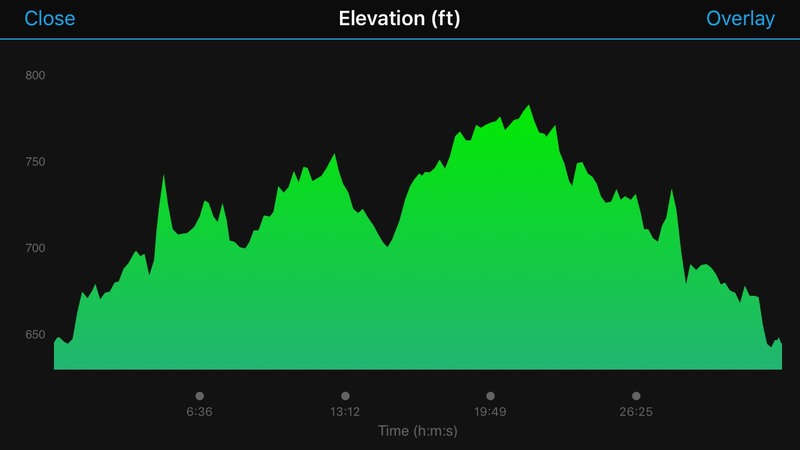 It was warm and quite humid, but even with the hills I felt pretty good, and beat last year's time by about four minutes. Next up: the Balboa Park 8 Miler in August. Political scientist Eric Magar has a blog post lamenting the potential end to the Mexican party system, showing how drastically the share of vote for PRD, PRI, and PAN has fallen. Un sistema de partidos robusto dota al proceso democrático de una buena dosis de estabilidad y predictibilidad. Esto puede apreciarse en el continente americano, cuyos partidos varían mucho. Los países andinos, y entre ellos Ecuador particularmente, han sido célebres por la debilidad endémica de sus sistemas de partidos. 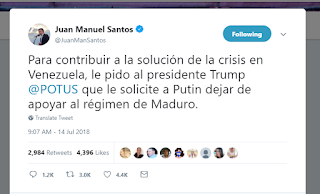 En su monografía sobre los sistemas de partidos de Latinoamérica, Mainwaring y Scully se refieren al ecuatoriano como "rudimentario", caracterizado por el multipartidismo, la ausencia de vínculos sólidos con el electorado y su permanente mutabilidad.1 En contraste, los autores ubicaron al mexicano entre los sistemas de partidos más "institucionalizados". Atribuyen nuestro relativo éxito para cambiar el modelo económico a esta diferencia. First, strong parties with organic ties to their constituents do matter. I don't want to downplay that too much. 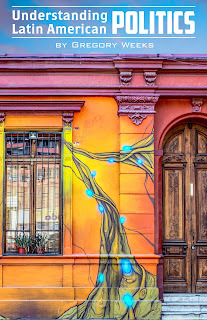 Second, it is tricky to use the Andean countries as an example of things falling apart. Bolivia and Ecuador actually stabilized dramatically under Evo Morales and Rafael Correa. Correa even stepped down voluntarily rather than give in to temptation (which of course Morales could not resist). Starting in 2006, when both Correa and Felipe Calderón were elected, Ecuador has become more stable than Mexico. In a 2016-2017 LAPOP survey, 20% in Ecuador trusted political parties compared to 13.8% in Mexico (Bolivia is also higher at 16.3%). Third, the Mainwaring and Scully analysis is 1995 so cannot account for the drug war and associated organized crime, which connects to immigration as well. Mexicans are unhappy with corruption and violence, not the economic system per se. Incidentally, Bolivia suffered under the U.S. drug war too, and has been doing much better after turning to the Brazilians rather than the United States. I don't have a firm conclusion here, except maybe that Mexico's current shake up isn't necessarily the end of the world. It's tough to compare to the Andean region because the history of parties there is so different, but they've been doing pretty well. Mexico, with its strong parties, has not. For some background, see my earlier post.